The Sleeper Has Awakened: How can we really help the poor effectively? Recently I made a post title : The donators and beggars - what`s between these bonds. Appreciate to those who had read my article and leave a comment. I think that is the best way for us to share thought even my article been opposed. Today my article is basically same as previous but its stress more on how can we help the poor/less fortunate people effectively? As we know that the malaysian is born with a good culture i.e "generous", but unfortunately nowadays by being generous, its like a cancer in our society that killing us slowly. The first and very crucial step that we must take is - DONT give to beggars. Ohh Yes I realize that sound cruel disregard to others, don`t tell me that i`m so cruel and callous to them. If I am, why should I waste my time to write this kind of article to open a view for public especially to all my friends. In Malaysia, You can see a lot of beggars that are clearly look poor around KL, Its normal, Its happening in any developed country. Can you just ignore such clear need without guilt creeping on you? seriously I cant, but I still wont throw even a cent into beggars cup. its because I realize that by giving money to beggars is a seriously bad act!! By choosing to give money to beggars its show that you are not really concern about what can ringgit brings to the charity? like I stressed before in my previous post, everyone has duty to help the less fortunate, but you should not just give, you should give EFFECTIVELY. Just take a look on my simple example, If you really care about the OKUs, which will you prefer? 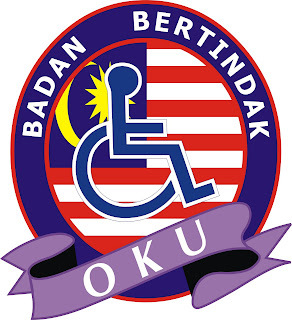 make a donation to the OKUs who just holding a pack of tissue and begging OR donate your money to the OKUs charity that clearly non profit organization who help the registered OKUs by providing a training such as drawing, playing music instruments and others, So in future they can survive to live with a proper job rather than just begging. Like what Mr Thadj quoted in my previous article - " If you give a person a fish, you only feed them for a day, but if you teach them how to catch a fish, you feed them for a lifetime". So just take a moment to think how many less fortunate people that can be help by each ringgit that you donate to the charity instead give money to feed a single beggar because of your kind sincerity and generosity. Not just that fellas, if we can donate our money effectively, we can also reduce the activities of syndicates, mafia and etc who use the less fortunate people for their own profit, What did you feel when watching slumdog millionaire movie, a scene when one member of bad syndicate trying to pull out the eyes of innocent kids? so in return the kids can gain a sympathy from the people along the street for their own sake. Thats the real cruel fellas. So fellas, Its time for you to decide which one is better, but believe me if you wish to help the poor, The BEST way is wait until you you`re home, and then write a check , using CIMB click or M2U and choose to donate your money to any registered charity. It is more worth it. Remember fellas,each one of us play roles to develop good society. Dont you ever dream to belong to one good society? So start from now, donate your money effectively. By doing so we are acctually sending a message to those beggars out there to work not beg. We are the society! We donate to them with sincere but are they being honest to us? Yang dtg mintak kat kedai makan tu kategori ape ek ? ?